This classic brogue shoe from Morgan & Co is the perfect addition to your wardrobe for the season ahead. 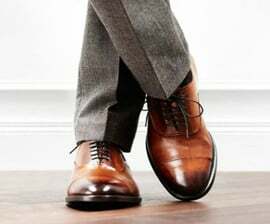 This dressy shoe is made eith leather uppers and a man made sole. They also feature a brogue detail at the front and at the sides of the shoe. They are laced for the perfect fit and also to ensure they're easy to get on and off. They have a wooden and PU sole. These shoes are perfect for everyday use or even for special occasions. They compliment any outfit.